Rob and I headed across to the Lakes to stay at grange, the weather forecast was good (for Saturday at least). The plan was to try some of the other crags in Borrowdale (i.e. not Shepards) and tick off some routes on the 25 best VS/HVS in Borrowdale list. We opted for some stared routes on Lower Falcon Crag. The crag is a short walk from the parking (10 minutes to the base of the routes, maximum) but there is a lot of brambles to be aware. The weather was great, it could have been (and probably was) the summer. We started on Spinup (VS 4c) and Jamie joined us as we finished the first pitch. The whole route is excellent but pitch two has a particularly nice traverse with some interesting down climbing to access it. 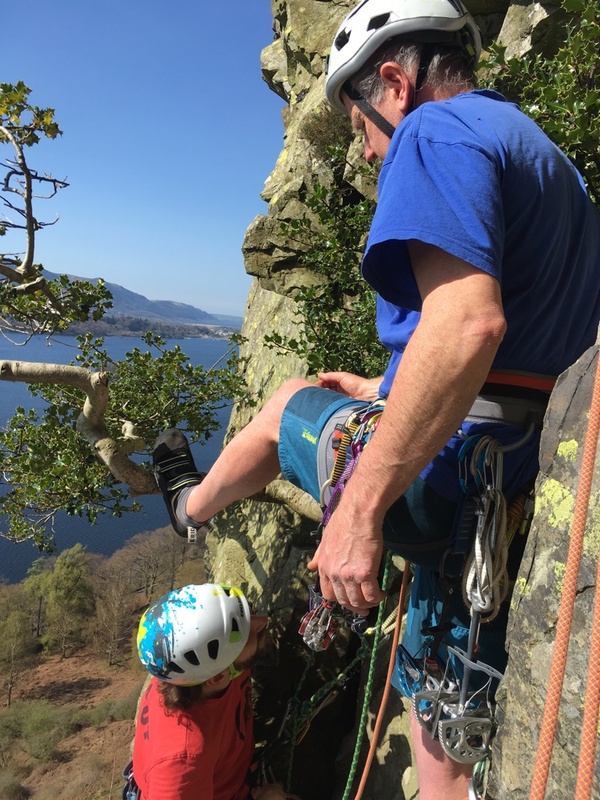 Due to a bird restriction the descent is by abseil form the centre of the crag, its free hanging in places so don’t forget the prussic and passes Illusion and Usurper, so plenty of opportunity to inspect the harder routes. Is that a new tick? No, I think you have to finish the route first Rob. Next was Hedera Grooves (VS 4b, although I’m not sure it was easier than Spinup), well worth the two stars with nice two dimensional climbing before the traverse on pitch one and challenging start of pitch two through a holly bush. Last route of the day was Illusion (HVS 5a), the crux of which is accessing the 15(ish)m traverse using a large hanging flake, which some of us foot traversed and others hand traversed (interesting choice when trying to get the gear back). The gear is good but spaced, and the climbing technical in a few places. The guidebook mentions this being a loose crag, there were a few loose holds but given this was early in the year after a cold winter its to be expected. Be aware there were quite a few ticks found after we returned home. Next day was a bit pish so we headed home via Bramcrag Quarry to check out future options. The place is heaving with bolted routes at all grades. It will be well worth a visit on a nicer day. This entry was posted on Friday, May 18th, 2018 at 11:27 am	and is filed under Climbing, Crags. You can follow any responses to this entry through the RSS 2.0 feed. You can leave a response, or trackback from your own site.